“Don’t believe your lying eyes.” At Nov. 26th “Community Conversation”, Project Connect study director Kyle Keahey showed bar chart indicating overwhelming public support for “Lamar” sector, yet proceeded to justify study team’s selection of “ERC” and “Highland”. Photo: Julie Montgomery. And it’s not for the faint-hearted or the techno-wimpish: “WARNING: this will not be a layman’s discussion; this is an in-depth data-dig and technical review.” It’s hard to tell whether that’s a warning to intimidate the public and scare off the masses, or an effort to impress potential attendees with the daunting and immutable rectitude of Project Connect’s study efforts and final product. But why have the study team suddenly decided to start publicly “digging into the data” now, setting a date 2.5 weeks after they made their decision (Nov. 15th) about where they wanted to put urban rail? Why didn’t they open these kinds of critical assumptions and methodological decisions to public discussion months ago? Maybe they sense the mounting community outrage and anger at being treated like yokels by a flim-flam artist? And perhaps they’re starting to realize how seriously their credibility (and that of public officialdom generally) are being impugned by the barrage of savvy, insightful critical scrutiny of their shenanigans that has emerged, bolstering that community pushback. • “Highland” sector favored by Project Connect — but where’s the travel demand? That sounds a bit like they’re approaching this as an exercise in explaining the complexities of their arcane brilliance to us benighted peons. After all, that’s pretty much the way they’ve conducted their so-called “public participation” process. Despite all their assurances of “transparency”, they’ve conducted this study with about the transparency of peat moss, keeping their most critical deliberations virtually locked within a reinforced bunker. Let’s hope community participants at Tuesday’s meeting will be able to drill somewhat into that bunker. Even more importantly, Project Connect’s urban rail program needs to be put on Pause. It took the wrong track back there, and has not only some explaining to do, but some reversing as well. 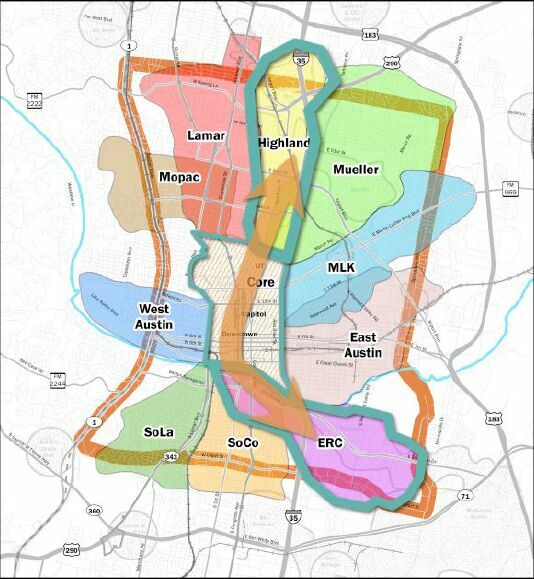 Closeup of City’s Central Austin Transit Study map, showing core, potential rail corridors, and City’s version of route to “North Central Austin” (Hyde Park via Speedway). Guadalupe-Lamar was avoided. Map: Snip from COA document. As one can see in the map above, within this huge central study area, Project Connect then carved up a number of major study districts — which it then labeled “sub-corridors” (since the entire center of the city was now labeled a “corridor”). Rather than actual travel corridors — which are what you’d need to study fixed transit facilities like urban rail — these subdivisions are, in effect, huge, sprawling sectors of the center-city, mostly comprising several square miles. “Mueller”, for example, reaches out of the Mueller development site to reach central neighborhoods west of I-35, and north to gulp up most of Northeast Austin. CATS map of actual potential rail corridors studied. Map: COA and URS. 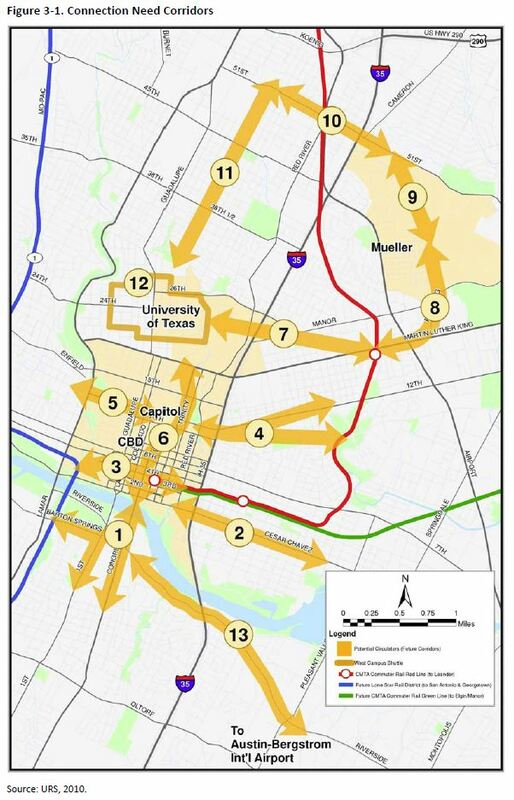 However, then, as now, the basic aim was to justify a Phase 1 urban rail route through the east side of the UT campus and on out to the Mueller redevelopment site. So the study and the map of selected corridors were cleverly contrived to confine and steer the study in the “proper” direction. In particular, notice how the City planning team studiously avoided the most obvious route going north from the campus — up Guadalupe and North Lamar. 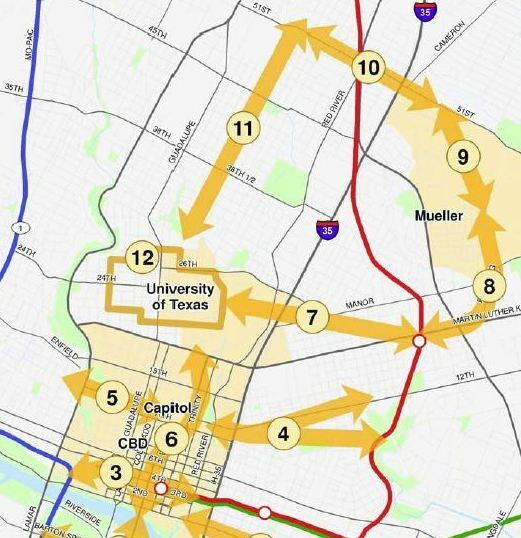 Instead, Corridor #11 is fashioned as “University of Texas (UT) to North Central Austin (Hyde Park)”, and directed up Speedway (a minor arterial that’s almost a neighborhood street) as far as 51st St. And of course, it’s purpose is to make a connection to … Mueller! But manipulating the routes was only half the game. The other half was manipulating the evaluatory methodology. For the 2010 study, that was a lot simpler than now. Instead of “gerrymandering” data, playing with projections and hypothetical growth rates, and assigning heavy freeway traffic to relatively quiet neighborhoods, the City and URS team in 2010 just devised a simple, subjective 1-2-3 rating system that allowed them to assign a subjective “score” at whim to the various corridors. And whaddaya know … Mueller won! But the point is that more or less real travel corridors were studied in 2010, although they were shaped and located to fit the outcome desired by top officials. So local planners do know what real corridors should look like. And it’s real travel corridors that Project Connect’s urban rail study should have been scrutinizing and evaluating all along. That’s what the Austin community deserves. 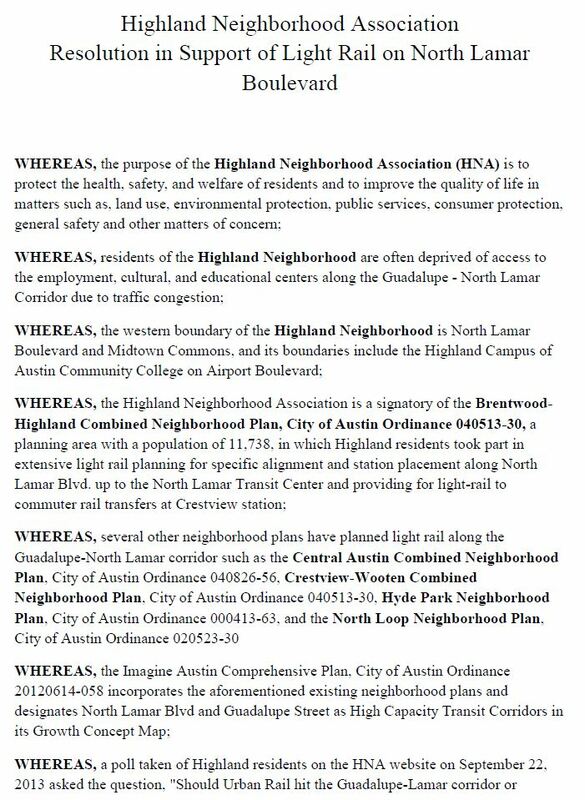 Instead, what Austin has gotten so far is another exercise in smoke-and-mirrors “planning” intended again to achieve a desired outcome. Despite Project Connect’s startling claim, “Lamar” sector (left) has significantly higher ridership than “Highland” (right). Graph: ARN, from Project Connect data matrix. During Project Connect’s somewhat eyebrow-raising rollout of the urban rail study team’s much-vaunted route decision at the Central Corridor Advisory Group meeting of November 15th, study director Kyle Keahey valiantly was attempting to combat considerable skepticism surrounding the project by highlighting some of the team’s supposed “findings”. 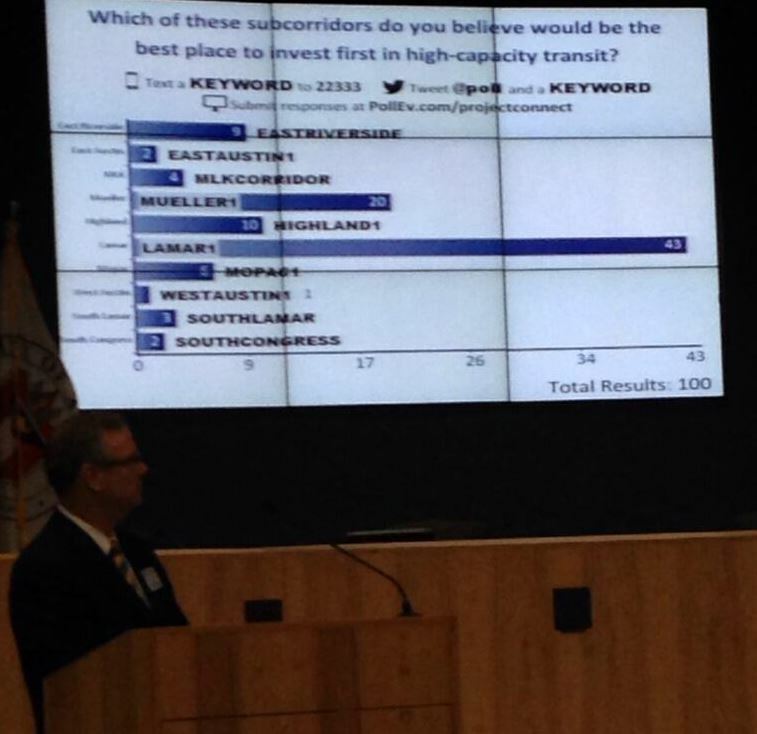 Perhaps in an effort to demonstrate even-handedness, Keahey had already shown a bar chart illustrating overwhelming popular support for the “Lamar” sector (“sub-corridor” in Project Connect parlance), totaled from public input, but he undoubtedly realized he needed to reveal the team’s “evidence” for their contrary decision. So, trying to justify the selection of the “ERC” (East Riverside) and “Highland” sectors, Keahey assured the audience that “Lamar” (a huge sector of over 4.5 square miles, stretching from east of North Lamar west to Shoal Creek) just didn’t have the desired characteristics. 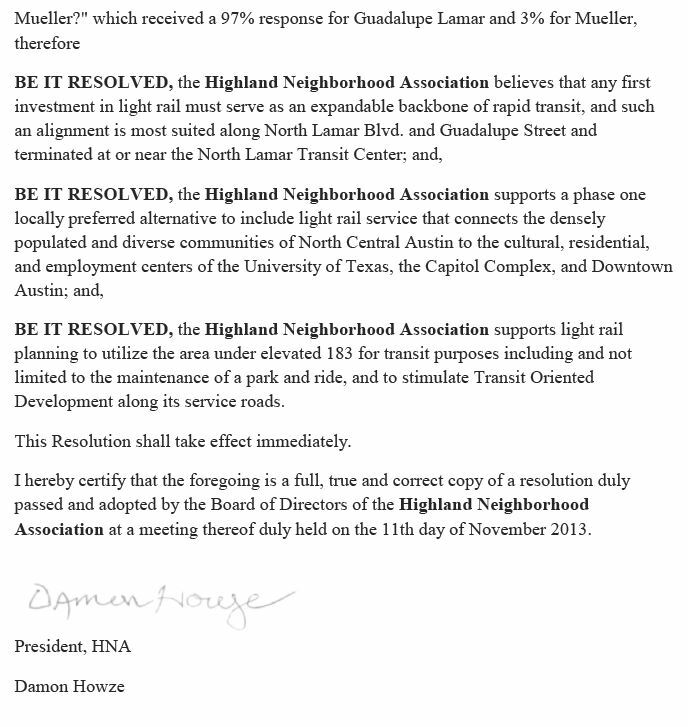 The Guadalupe-Lamar corridor is well-known for its relatively high transit ridership (after all, it was the top choice for the MetroRapid special bus service planned to open in 2014), so apparently the study team has been hard-pressed to disparage the “Lamar” sector on its strongest points. There are several problems with this comparison, starting with the fact that Project Connect has utterly failed to evaluate actual travel corridor ridership (and any other data, for that matter). Instead, the ridership figures (apparently obtained from Capital Metro) apply to all transit ridership, going in all directions. But wasn’t this a study of travel from these sectors to the core area? One of the problems with this is that those sectors (which include “Highland” and “ERC”) that happen to encompass major transit route interchange hubs suddenly seem to have far more ridership than a sector (like “Lamar”) distinguished for its heavy corridor ridership. 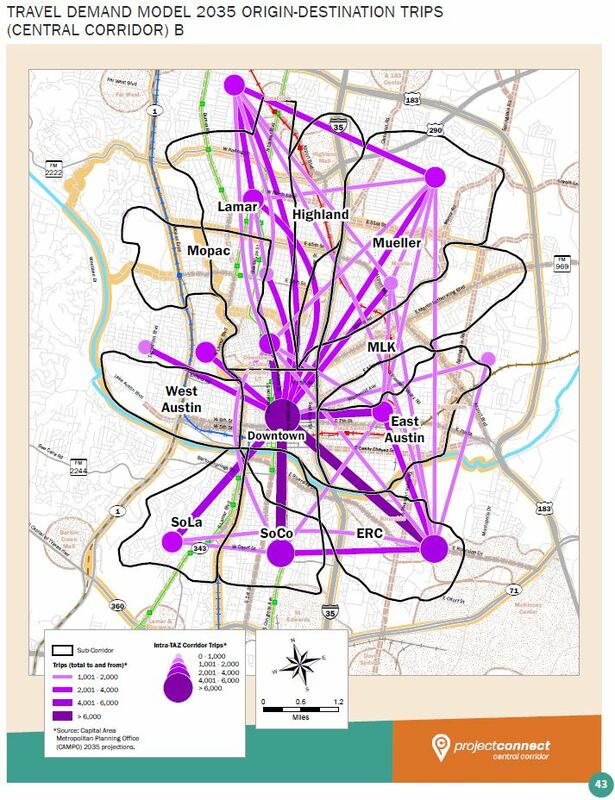 This is almost certainly a clear advantage of the “ERC” sector, with clusters of crosstown routes interchanging with UT shuttlebus routes serving student housing and other general routes linking to the core area. While higher ridership is tallied for “ERC”, this does seem to correlate somewhat with the service level. Altogether, the “ERC” sector has a total of 37 routes, according to Project Connect’s evaluation matrix, compared with 26 for the “Lamar” sector — a ratio of 1.42. This is close to the ratio in “Total Existing Transit Ridership”: “ERC” with 9,648, “Lamar” with 6,990 — a ratio of 1.35. This suggests that ridership may be driven somewhat by the level of service (i.e., number of routes) provided to the sector. But what about the “Highland” sector? Keahey’s claim that “Highland” currently exhibits higher ridership than the “Lamar” sector was quite shocking, even leaving aside the major interchange at the ACC Highland hub. And it turns out this claim simply isn’t true — by Project Connect’s own evaluation data matrix. 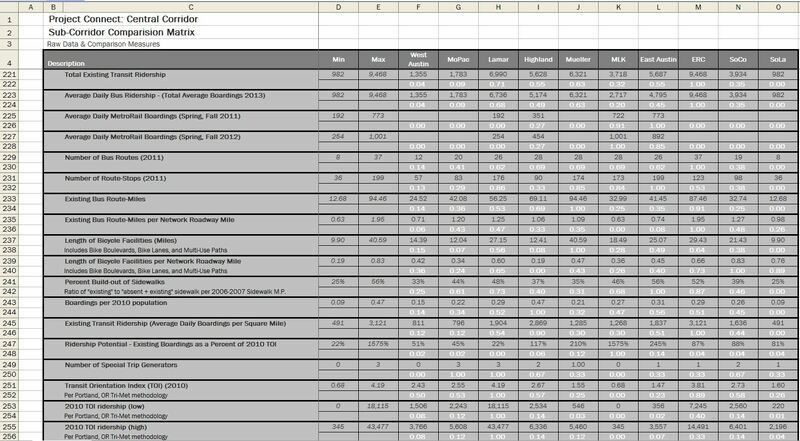 Project Connect Evaluation Data Table page with ridership data. Closeup of matrix data for “Lamar” and “Highland” sectors. The actual data, above, seem clearly to contradict and refute Keahey’s “bombshell” claim that transit ridership in “Highland” beats that in the “Lamar” sector. By the “Total Existing Transit Ridership” metric, “Lamar” has 6,990, vs. “Highland” with 5,628 — leaving “Lamar” 24% higher (see bar graph at top of post). 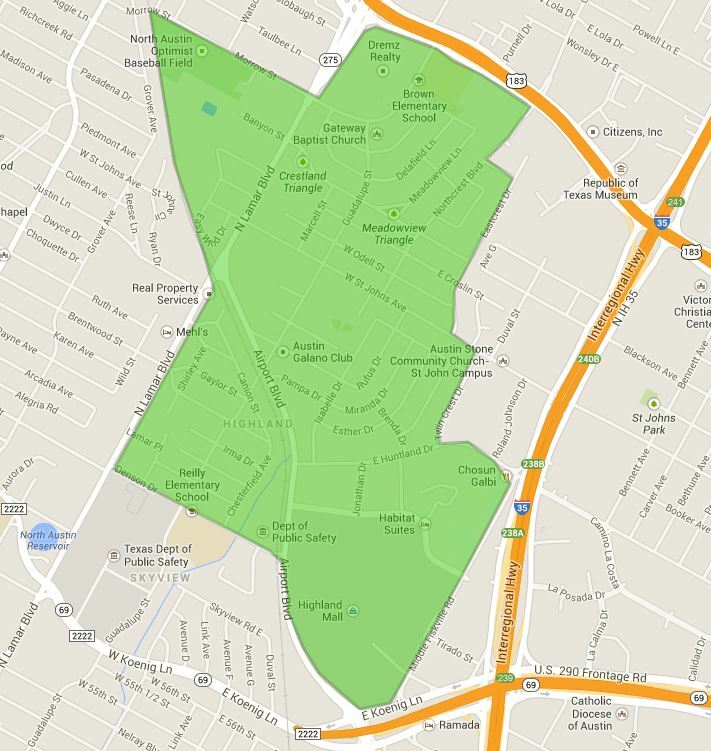 By the “Average Daily Bus Ridership” metric, Lamar” has 6,736, vs. “Highland” with 5,174 — leaving “Lamar” 30% higher. “Highland” sector favored by Project Connect — but where’s the travel demand? Closeup of data visualization of 2035 travel demand projection focusing on “Highland” sector. Snip by L. Henry of Project Connect infographic. 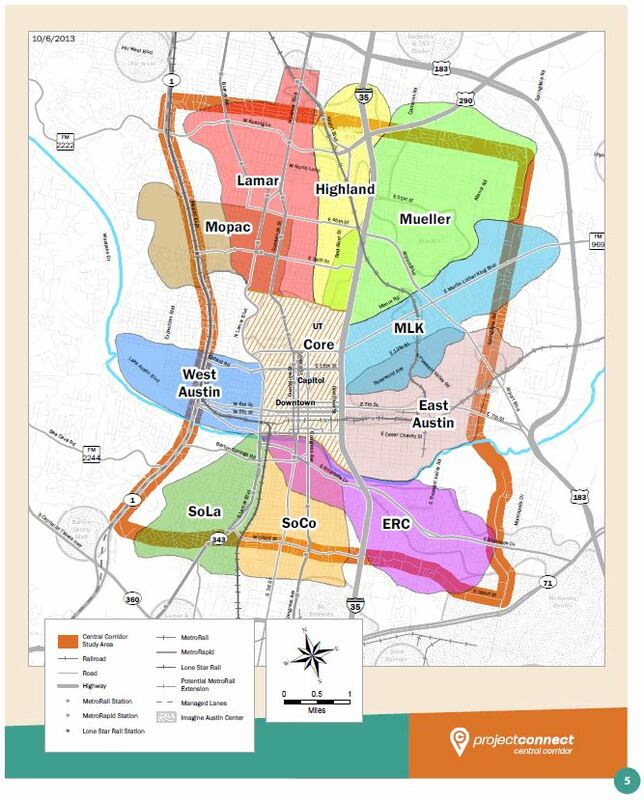 As this blog recently reported, on Nov. 15th, Project Connect — newly empowered by Austin’s Mayor Lee Leffingwell to make the de facto final decision on urban rail — selected the “ERC” sector (with the somewhat daunting East Riverside corridor) in South Austin and the “Highland” sector (suspected to be a proxy for the western “Mueller” sector) in central Austin. Project Connect’s anointed sectors (“sub-corridors”) for urban rail, selected on Nov. 15th. Map: Project Connect. While the significant and growing Highland campus of Austin Community College (ACC) has been profusely brandished as a major activity center justifying “Highland” (in effect, a “gerrymandered” sector fabricated from pieces of the actual Highland and several other core-city neighborhoods), there seems very little likelihood that a rail route in the “Highland” sector itself would actually reach Highland ACC anytime soon or possibly even … ever. 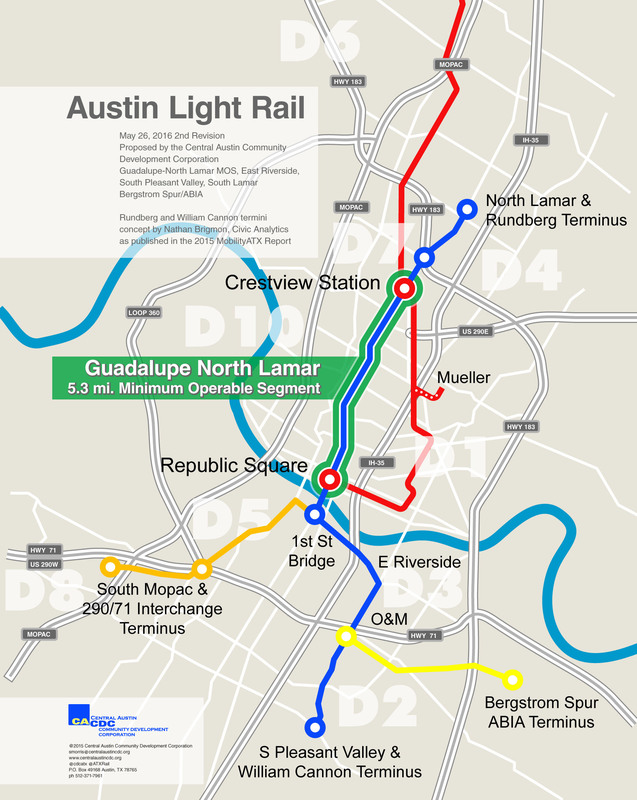 It’s likely that urban rail is intended only to reach Hancock Center (per the previous Mueller plan), then to take the same previously planned northeasterly route (through the Hancock property, then crossing Red Line tracks, then under I-35 via Airport, and into Mueller via Aldrich). Very daunting right-of-way constraints almost certainly will remain an obstacle to extending urban rail to Highland ACC. Besides the physical constraint of virtually no clear street right-of-way for an urban rail alignment to the core area, Project Connect’s chosen “Highland” sector presents another serious problem: extremely weak travel demand! This is revealed in the data visualization of travel demand forecast for 2035 by sector and displayed in Project Connect’s Map Book (v.5), p. 43, based on projections from CAMPO’s own travel demand model. Two JPG snips of this visualization (showing travel demand activity as vectors and intra-zonal travel as bubbles) are shown below, one for the study area as a whole, and the other a closer focus on the central core city. Travel demand in 2035 shows zero (or very weak) travel activity involving “Highland” sector. Infographic: CAMPO and Project Connect. Closeup of projected travel demand in central core city. In comparison with “Highland”, the infographics shown above seem to indicate significantly more projected travel demand not just in the rather large “Lamar” sector but all along the Guadalupe-Lamar corridor specifically. 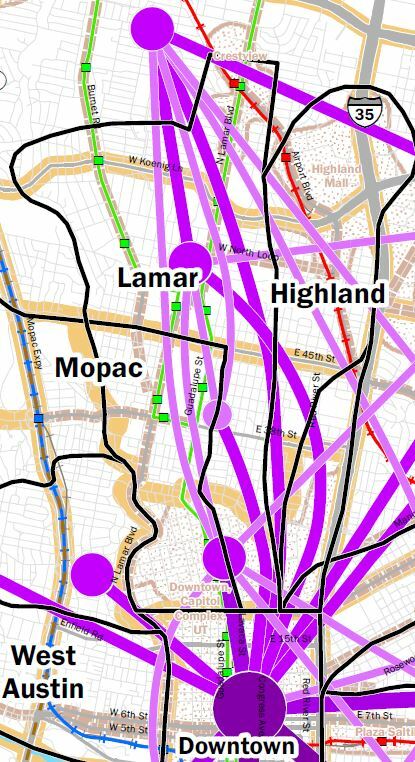 There’s also significant travel to what seems to represent a centroid just northwest of the boundaries of the “Lamar” sector, which it’s arguable is logically in the ridership catchment area for an urban rail line on Guadalupe-Lamar. A closeup of this visualization for a portion of the “Highland” sector (including the Highland ACC area) is shown at the top of this posting. In contrast to the seemingly intense travel demand involving the Guadalupe-Lamar, the “Highland” sector seems to have zero travel demand centroids or origin-destination points indicated, and there’s a total absence of “data bubbles” represent intra-zonal trips. This seemingly total lack of projected transit demand in for the “Highland” sector is actually rather puzzling. It’s reasonable to assume some degree of future travel demand between this area bordering the west side of I-35 and the core area. 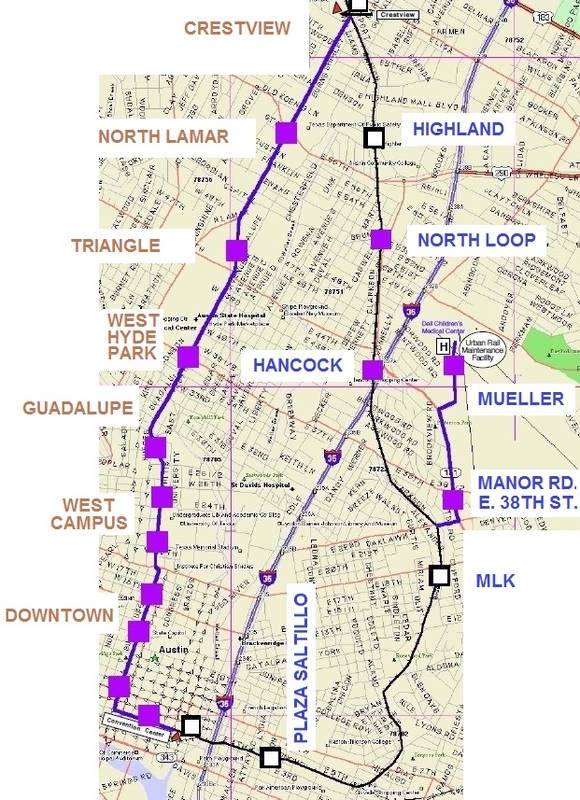 In any case, the data visualization suggests a projection by the CAMPO model that that this area is astoundingly weak in this respect compared to Guadalupe-Lamar — certainly contradicting the claims and conclusions of Project Connect’s top decisionmakers, including Kyle Keahey, who have emphasized the greater travel demand potential of “Highland” (and “ERC”) over the “Lamar” sector (and, implicitly, the actual Guadalupe-Lamar corridor). Basically, the evidence for this — in this presentation of CAMPO 2035 projection results — is simply not there. 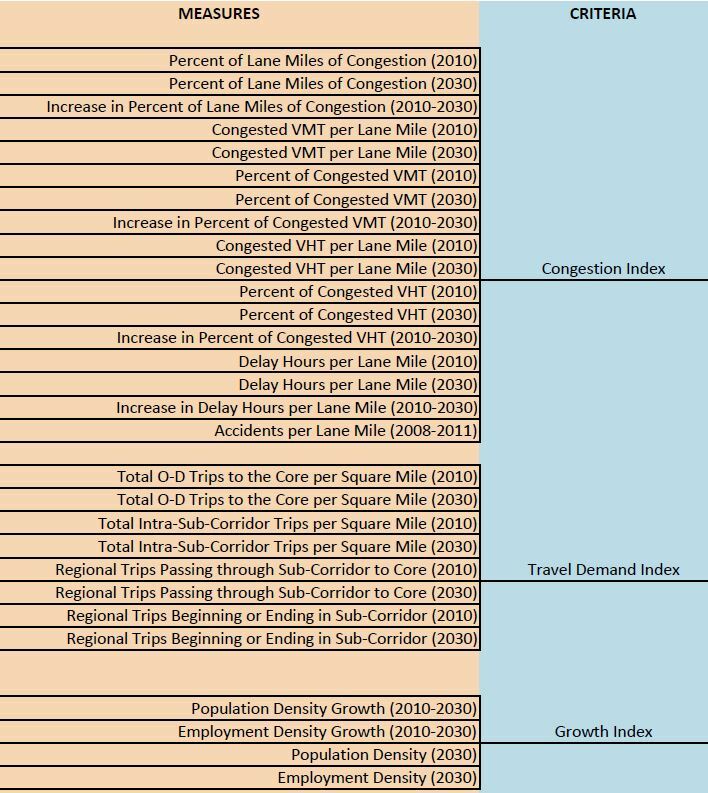 In fact, on the basis of this infographic, both the “Highland” and “MLK” sectors appear to have the weakest travel demand projected in the CAMPO travel demand model — possibly suggesting a deficiency in the model. 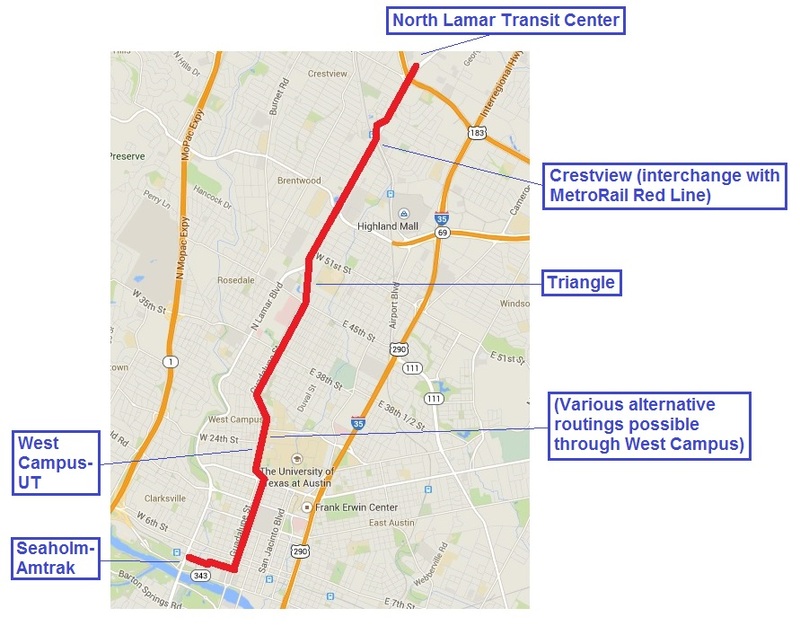 In any case, since Project Connect based its assessment significantly on this data, the results presented, and the contrary evidence of very strong travel demand in the Guadalupe-Lamar corridor, contradicting Project Connect’s own stated conclusions, should at the very least raise questions about the competency and integrity of the study process. This past Friday, Nov. 15th, to a meeting of the Central Corridor Advisory Group (CCAG), the Project Connect (ProCon) team presented their “recommendation” of sectors (misnamed “sub-corridors”) for the first urban rail route(s) — a combination of “Highland” (a proxy to facilitate city officials’ desired route to Mueller) and “ERC” (containing the East Riverside Corridor, which the City has been heavily promoting as a development district). Project Connect’s “recommendation” revealed on Nov. 15th. Photo: ProCon. 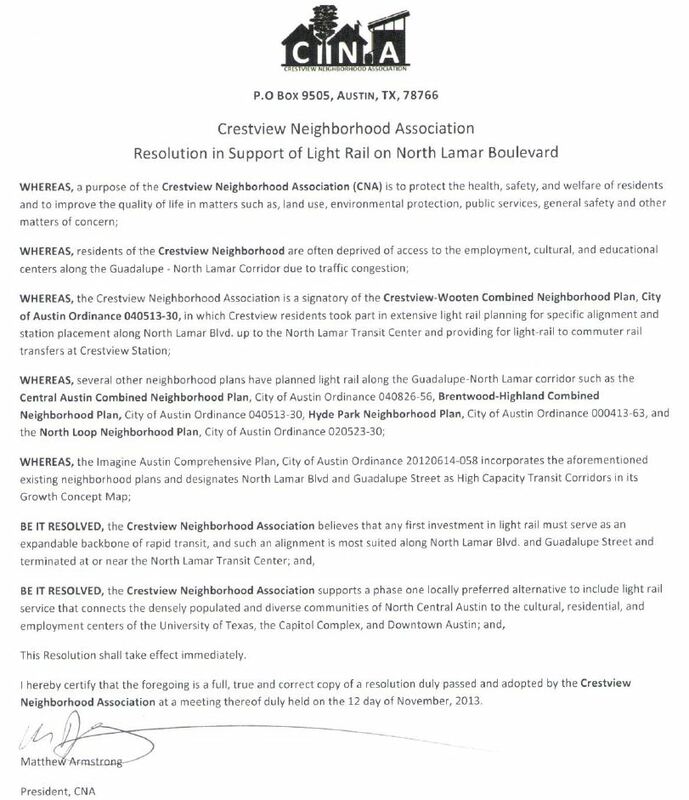 Just a few days prior to Friday’s meeting, COA Mayor Lee Leffingwell cancelled plans to bring the selection of a sector for urban rail to both the Capital Metro board and the entire City Council for a vote. Instead, in what’s being portrayed by critics as a kind of “palace coup”, the mayor has ditched plans for such votes and authorized Project Connect to make its own decision about a sector (which in effect clinches the basic route decision). Thus, ProCon’s Nov. 15th “recommendation” amounts to the actual decision to start planning urban rail routes — lo and behold, the same basic routes the city administration, Project Connect, and an assortment of real estate development interests have wanted all along. And all from a process that repeatedly seems to have rigged the game, and tilted the playing field. Kyle Keahey presented ProCon’s justification to the CCAG and the audience in the classic maneuver of a “data blitz” — a rapid PowerPoint barrage of tables of values, bar graphs, and bullet points almost guaranteed to dazzle and overwhelm. Assuring the CCAG attendees that his team had been busy slicing, dicing, and splicing the data approximately six different ways, including subjecting all that abundant data to a “sensitivity analysis”, Keahey wrapped up his case for basically the original official route plan (a line leading from downtown through UT’s East Campus to Hancock Center and eventually to the Mueller site, plus a route to bolster real estate and other commercial development along East Riverside). But the core problems with ProCon’s exercise go far deeper. In addition to the numerous data anomalies (and the lack of public access to the raw data being used), there are serious methodological faults. Perhaps the most troubling involves the fundamental concept and approach of the study itself, discussed in Austin Rail Now’s article Project Connect’s “corridor” study — without corridors! As the article cited above indicates, rather than performing a bona fide study of actual alternative corridors, ProCon embarked on what amounted to an inventory of highly filtered attributes of basically gerrymandered sectors, dubbed “sub-corridors”, devolving into a kind of “beauty contest” among sectors of the city, while distorting as well as ignoring the actual travel corridors that should have been the focus. Snippet of ProCon’s evaluation matrix shows preponderant emphasis on hypothetical future projections rather than current factual data. This is especially true in regard to locational projections, i.e., projections of future developments in specific geographical locations. Beyond a roughly five-year horizon, projections for specific neighborhoods and similar chunks of real estate basically become unreliably speculative — which seems to be what we’ve actually been dealing with … a significant dollop of real estate speculation, given a kind of veneer of “techniness” by CAMPO and their land use/travel demand model package. (2) Percentages and growth rates — Obviously, percentages (of poverty, transit dependency, etc.) and growth rates can be somewhat useful indicators, but relying on them overwhelmingly, as ProCon’s methodology does, can skew the planning process. Neither actual population, nor actual transit ridership in an actual corridor between any sector and the core, is considered as a measure! Percentages can be deceptive, especially when it comes to forecasting transit ridership. Area A may have a population of 100, of which 50 are transit-dependent — 50% transit dependency. Area B may have 10,000 population, of which 2,000 are transit-dependent — 20% transit dependency. If you have a rating system that awards the higher score to the higher rate, then you’re giving a higher score to an area that will yield you only 50 potential transit-dependent riders, vs. an area that will yield you 2000! Likewise with growth rates. If Area A is projected to grow over 20 years from 100 to 1000 residents, that’s a 900% growth rate. Meanwhile, much larger Area B is projected to grow from 40,000 to 50,000 — a 25% growth rate. Again, if your rating system awards scores based on growth rate, Area A will get the overwhelmingly higher rating. 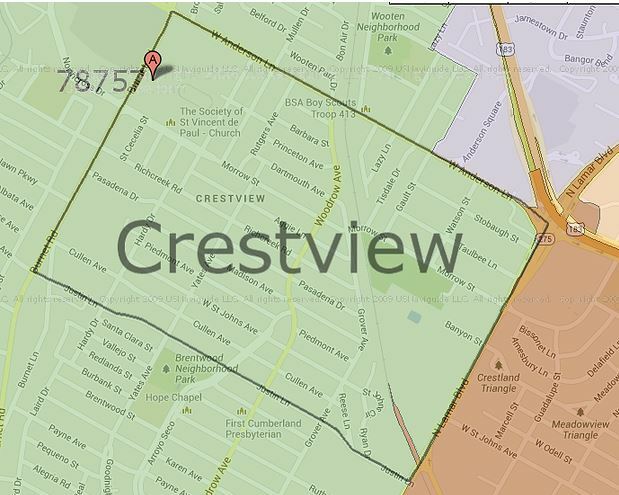 Yet Area A provides only 1,000 residents as a market for your transit line, whereas Area B provides 50,000! ProCon’s evaluation methodology measures have over a dozen of this type of potentially fallacious characteristic. And ProCon’s growth rates, by presuming the validity of 2030 projections of land use and travel demand, compound the possible errors associated with the first category discussed, Projections. (3) Black Box — For all their assurances of “transparency”, ProCon’s methodology for integrating and manipulating all these evaluation measures, and merging them into a model to render ratings, remains totally mysterious. Here and there are other occult items, such as the “Transit Orientation Index” (whazzat? ), which seems to be rendering ratings for 2010 and 2030. If documentation of these model processes is available on the ProCon website, they sure have it well-concealed. So far, it’s either absurdly difficult or impossible to find anything either on their website or through Google searches. 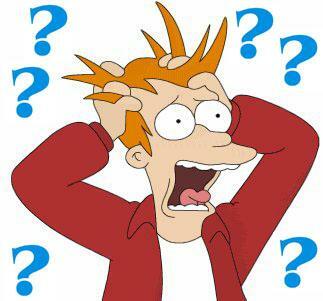 How could a study, from fallacious basic concept to botched data analysis, go so wrong? • Rush, rush, rush — From the outset, the ProCon team, apparently goaded by an impatient COA administration, has been puzzling both participants and observers of the study by their unprecedented breakneck race to wrap up an exceptionally complicated study — on an inordinately brief timeframe — and jump to a conclusion. • De facto objective — Suspicions are now rampant that the real aim, all along, behind the scenes, has been to find a way to deploy data “truthiness” (i.e., creatively selective collection and manipulation of data and advantageous “projections”) to justify the original rail route preferences of a small clique of powerful local political leaders and real estate interests to bolster and enhance somewhat speculative real estate investments in certain sectors of Austin. • Muzzling the public — As I said in my own Citizen Communication remarks, the ProCon team have pretty much operated in a kind of bell jar, insulating and isolating themselves from effective interaction and cooperation with the public, so I’ve really never had an opportunity for a substantive discussion of these issues. Among some critics, ProCon’s ostensible selection of East Riverside and the so-called “Highland” sector is seen as basically camouflage for a stratagem focused on developing the desired line from downtown to Hancock Center, which was being considered by ProCon anyway for months prior to the start of the “study”. The expensive East Riverside line (requiring heavy investment in a new bridge across the Colorado as well as a rebuilding of the grade separation with I-35) would likely be put on hold until the Mueller line as far as Hancock is completed; the final Mueller link could be added later. Both critics and many community observers, favoring urban rail but increasingly skeptical of ProCon and their methods, are planning to ratchet up their opposition to this ill-conceived plan. In effect, Project Connect seems to be preparing to push Austin toward a vote for an expensive rail investment in what would typically be an uphill struggle, but now with the added challenge of having made enemies out of its strongest pro-rail allies in the heart of the core city. You are currently browsing the _______________Austin Rail Now blog archives for November, 2013.